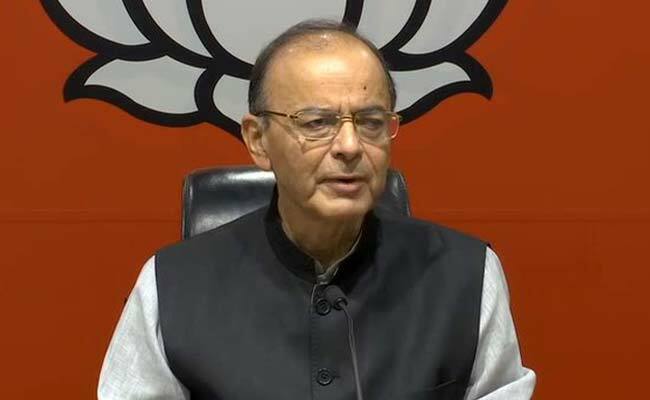 Finance Minister Arun Jaitley today came down heavily on the Congress for protesting against the income tax department in Karnataka, amid allegations by Chief Minister HD Kumaraswamy that tax raids were unleashed by the centre on people linked to the Congress-Janata Dal Secular coalition in the southern state. Mr Jaitley in a Facebook post said the "disproportionality" of the reaction of the Congress and the JDS raised a needle of suspicion. "If no politician has been searched, no minister has been searched, then why the protest? The Bengaluru case is a textbook method of the UPA on 2 fronts: use government money, round trip it through contractors and beneficiaries to enrich themselves and then lip sympathy for federalism destroying it whenever the opportunity arises. This is a very transparent self-goal," Mr Jaitley said in the post titled "The UPA makes corruption a cause". Led by Mr Kumaraswamy, Congress and JDS leaders protested in front of the income tax department in Bengaluru on Thursday as tax officers launched raids across Karnataka. Mr Jaitley said it was unprecedented that the chief minister of a state joined the street protest against income tax searches with a political motivation. "...Was the minister's nephew a PWD (public works department) contractor to whom largesses have been given - a case of nepotism? The CM and the ministers who joined the protest need to answer these questions," Mr Jaitley said. Responding to Mr Jaitley, Mr Kumaraswamy today alleged the tax department was "harassing" Congress and JDS workers and sought "immediate intervention" of the Election Commission. "A shameful attempt to threaten and generate fear among our workers. We request the Election Commission to immediately intervene and stop this harassment of our workers," the chief minister tweeted. The ruling alliance leaders had said the raids on Thursday were targeted at minor irrigation minister CS Puttaraju, his relatives, and associates of Mr Kumaraswamy's brother, PWD minister HD Revanna. The crackdown came a day after Mr Kumaraswamy claimed that pre-dawn tax raids had been planned on Thursday.